Series LF25AUB-Z3 Lead Free Water Pressure Reducing Valves are used in commercial and residential applications to reduce incoming water pressure for protection of plumbing system components and to reduce water consumption. 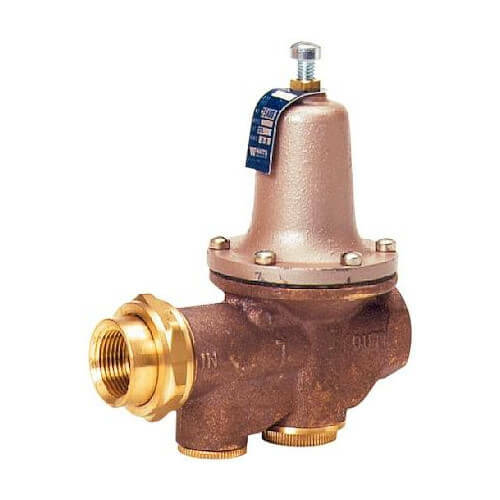 It consists of a Lead Free brass body construction, union inlet connection, integral stainless steel strainer and high temperature resistant reinforced diaphragm for hot water. The Series LF25AUB-Z3 is available with a variety of end connections including: threaded, solder, PEX, quick-connect and CPVC with both union and double union connections. Series LF25AUB-Z3 has an adjustable pressure range and is serviceable in-line. Maximum Working Pressure: 300psi (21 bar), Adjustable Reduced Pressure Range: 25 to 75psi (172 to 517 kPa), Standard Pressure Setting: 50psi (344kPa).